This recipe is a favorite snack of my daughter, she likes them for an after school or as a late night treat. The great thing about them is you can change up the meat, cheese and sauces for a completely different taste. Microwave the flour tortilla for 15-20 seconds to make it soft and pliable. Spread with mayo and ranch dressing, sprinkle with black pepper. Add shredded cheese on top of mayo/ranch, then add lettuce and ham. 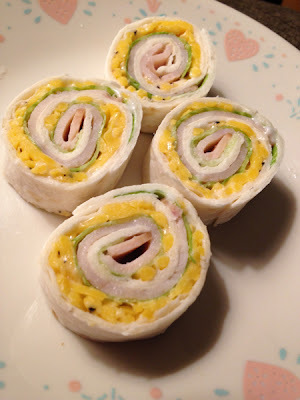 Roll tightly jelly roll style. I kinda squeeze it a little as I'm rolling. Place the open end down on a cutting board and slice into 1 inch pinwheels. I've used turkey and roast beef, swiss cheese and provolone, I've also used mayo and horseradish sauce… just whatever you like. If you like it and you can roll it up, I don't think you can go wrong.